Our council has R.E.A.L. (Remarkable, Energetic, Aspirational Leader) girls! Meet Tyra Gantt! 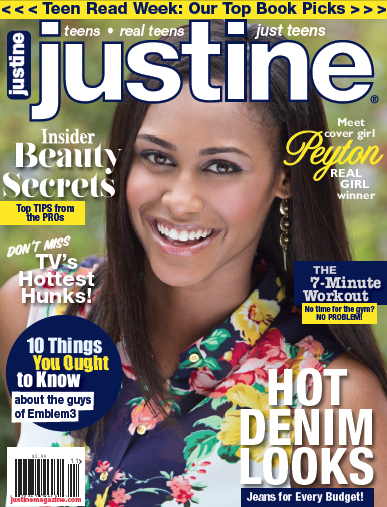 Every year in their fall issue, Justine Magazine shines the spotlight on one girl who is particularly R.E.A.L (a Remarkable, Energetic, Aspirational Leader) and also a Girl Scout. This year’s honoree, Tyra Peyton Gantt, is a stellar example of all these qualities— we know you’ll think she’s as great as we do! A Girl Scout since kindergarten, Peyton has had the typical experiences like camping and earning badges, and she also has scouting to thank for her future career choice! After being chosen to appear in a print ad and a TV commercial for Girl Scouts, Peyton was hooked on modeling. She even got to go to New York for several months last year to pursue modeling opportunities. “Girl Scouts helped me develop the courage and confidence to achieve my dreams,” she says. Back home in California, Peyton is a busy high school student, still involved in Girl Scouts, dance and school organizations including a club that sponsors events for special education and general education students to spend time together once a week. Juggling studies, extracurriculars, service and her blossoming career, there’s no doubt tht this outstanding girl is keeping it R.E.A.L. You can read the full article in this month’s publication, available where magazines are sold, or come into our Redland’s office where we’ll keep a copy in our lobby! Previous Previous post: WATCH: Allisyn and Audrey do a little improv rapping! See them at B.I.G. Expo! Next Next post: Destination Unknown: A Secret Weekend Adventure!